A few months ago, Jamie and I had a fun afternoon styling a couple of "staged events" - just to play around with some ideas that we had brewing. Lisa of Lisa Levine Photography took the photos, and we had a great time. We will post more pictures and ideas from this photo shoot soon, but up today is the terrific Soapsational Creations, which is the handmade soap by Laurie Poyant Short. Laurie and I went to college together and reconnected on Facebook. She graciously donated a few of her soaps for our "baby shower" staged event. You can check out her website here and her Etsy store here. Soapsational Creations soap is a glycerin soap bar embedded with seasonal or themed images, photos, or company logos. 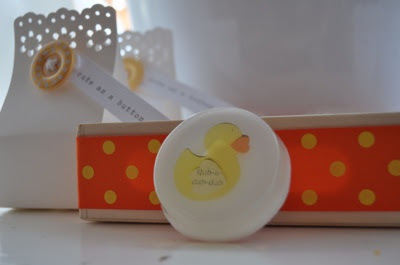 All soaps can be personalized per the client's request with messages, names, or non-copyrighted images. We asked Laurie for her input and we agreed that a little yellow duckie would be adorable. The creative process was interactive and fun. 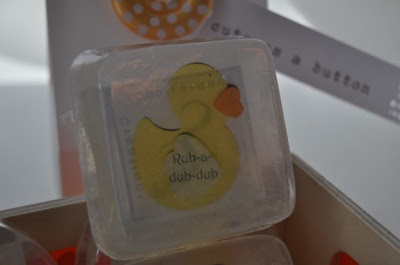 We asked her to have the soaps say "rub-a-dub-dub", and Laurie sent several mock-ups with different fonts until we chose the one we wanted. Laurie is a delight to work with, and we love love love her soaps! What great shower or wedding favors they would make, don't you think?